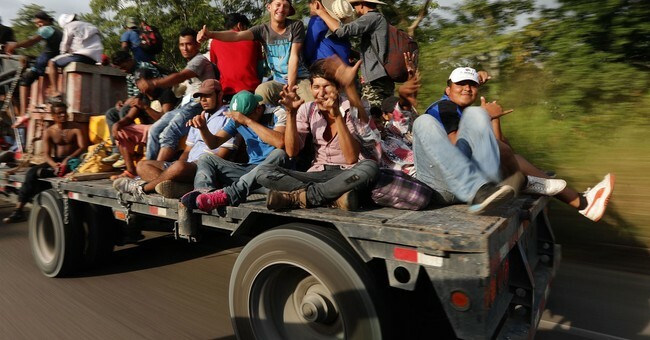 WASHINGTON -- President Donald Trump has reason to believe that the caravan of migrants heading toward the Southwest border might bring out his base of what he calls "forgotten" Americans. Progressives see his rhetoric as a "dog-whistle" for racists. But Trump voters I talk to see images of Central Americans marching toward the U.S. border and don't understand why activists and politicians support "offering a reward for being an illegal immigrant," as former Nevada Sen. Harry Reid put it in 1993. Many Trump fans have sympathy for people who want to create a better life, but the sense of entitlement from immigrants who are here illegally and their advocates disturbs them. They resent being painted as extremists or racists because they support duly enacted federal laws. And they remember when Democrats did too. In 2014, as Central Americans amassed at the border -- forcing President Barack Obama to order the detention of thousands of migrant families -- former Secretary of State Hillary Clinton said of 90,000 unaccompanied minors, "They should be sent back." "We have to send a clear message," Clinton told CNN. "Just because your child gets across the border doesn't mean the child gets to stay. We don't want to send a message that is contrary to our laws or will encourage more children to make that dangerous journey." In 2005, then Sen. Obama said, "We simply cannot allow people to pour into the United States undetected, undocumented, unchecked and circumventing the line of people who are waiting patiently, diligently and lawfully to become immigrants in this country." In his 1995 State of the Union address, President Bill Clinton talked at length about "abuse of our immigration laws," the jobs that otherwise might go to citizens or legal immigrants, and the burden on taxpayers. Clinton boasted that his administration "moved aggressively to secure our borders more by hiring a record number of new border guards" and "deporting twice as many criminal aliens as ever before." "Trump could have just copied the thing and read it," Mark Krikorian of the pro-enforcement Center for Immigration Studies said of the Democratic president's speech. A year earlier, Sen. Dianne Feinstein, D-Calif., ran for re-election by bashing her Republican opponent for voting against border guards. She opposed Proposition 187, a measure to deny state benefits for undocumented immigrants, because it "makes no provision whatsoever to deport illegal aliens and reduce their number." On national television in 1994, Feinstein argued that "40 percent of the babies born on Medicaid in California are born of illegal immigrants," presenting huge fiscal problems for the then broke Golden State. Feinstein also spoke against, "the illegal immigrants who come here and commit felonies." What changed? Some Democrats came to oppose enforcement as they passed laws to create "sanctuary cities," and then sanctuary states. Local laws that began as a way to safeguard otherwise law-abiding undocumented immigrants expanded to prohibit law enforcement from cooperating with Immigration and Customs Enforcement officials attempting to deport undocumented immigrants who committed serious crimes in the United States. And those who supported enforcement? They were called racists. Progressives have moved the party so far to the left that a growing number of Democrats now support abolishing ICE. Language also changed. In 2013, the Associated Press Stylebook directed users not to use the terms "illegal immigrant," "illegal alien, an illegal, illegals or undocumented" except in direct quotations. The preferred lexicon was to say people who were in the country "illegally." When Trump threw his hat into the White House ring in 2015, his language was the opposite of the AP Stylebook -- harsh and provocative. Mexico, the country he singled out, was exporting its worst people. "They're bringing drugs," he said. "They're bringing crime. They're rapists. And some, I assume, are good people." It's more than fair to call Trump's 2015 remarks race-baiting and offensive, because they were. But his harsh tone sent the message that he would support enforcement of immigration law. And it wouldn't just be lip service.